Fresh after crushing the 2014 Kentucky Derby with over $19,000 in winning tickets, the Super Screener correctly identified the top 4 Preakness finishers – almost in exact order! The Preakness screener correctly ranked California Chrome first and General A Rod fourth, and flipped Ride On Curlin (2nd) and Social Inclusion (3rd). Here is the complete ranking. With California Chrome winning as the overwhelming favorite, it was a difficult task to make money on the Preakness. But both the small and large wagering bundles doubled their investment on the race! The medium bundle cashed for $3.50 in Trifectas but did not quite return the investment. The highlight of the wagering recommendations was a $10 Trifecta wheel 3 with 10 with 1,2,7,8 which hit and paid $390! For readers that played the Super Screener Preakness Picks, we’d love to read your comments below. The Belmont Stakes figures to be more exciting than ever this year with the Triple Crown on the line and an all-star field assembling to go against California Chrome. The Belmont Stakes Super Screener will be available the Monday of Belmont Stakes week. Good Luck! 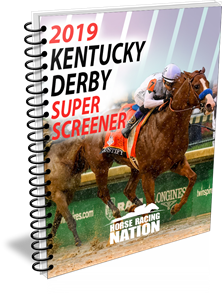 Get Your Copy of the 2016 Kentucky Derby Super Screener NOW! ← Previous Story Super Screener Crushes Kentucky Derby 2014! Next Story → Top Super Screener Choices SCORE on Kentucky Derby 2016! Only had $60 to play put know a little about handicapping and I’m a disabled person enjoys betting on racing for years. Won $160 back on that $60. I even new enough have the exact 3/10/8 as $1 tri. Thanks to you Mike, things look even clearer and I expect to have a great Belmont Stakes with your Super Screener! My friends at my Preakness Party were shocked when I hit the winner, hit the exacta, hit the trifecta, and hit the Superfecta for a total of +$533 !! I told them I was the greatest handicapper ever, oh and had a secret weapon….the Super Screener! My only regret is that I didn’t have enough money to purchase your large bundle. I am saving up for the Belmont and hoping that the favorite is beaten so I can enjoy a big payday; I know that you’re going to come through again.